Mayor Sara Duterte reminds everyone not to set aside the sacrifices of veterans and fallen heroes while strengthening bilateral partnerships with foreign allies during the 77th commemoration of Araw ng Kagitingan held at Veterans Monument yesterday. “Today, sisterhood agreements are instituted as integral tools in sustainable development and while we celebrate these bilateral and multilateral relations, we do not set aside yesterday’s war and oppression,” Duterte said in her speech delivered by City Administrator Zuleika Lopez. Duterte lauded the gallantry of soldiers who fought on the battle grounds of Bataan, Corregidor and Bessang Pass. She also recalled the valor of heroes rendered in the battle lines of Mamasapano and Marawi. During the commemoration, living veterans were honored for their acts of valor in pursuit of achieving peace for the nation. Col. Sharon G. Gernale of the Philippine Air Force also said the battle is not yet over after seven decades. “Day in and day out, we are raging wars against threats to our existence brought by our unfriendly neighbors and the proliferation of drugs,” Gernale said. Thus, she urged to not waste the gains of their sacrifices that everyone enjoys today. Meanwhile, on behalf of his fellow veterans, veteran Emmanuel Go thanked the city government for honoring their heroic deeds. 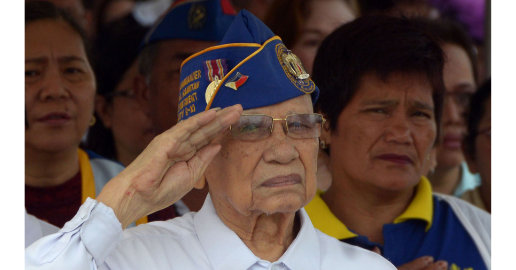 He also commended President Rodrigo Duterte for signing the Republic Act 11164, or the law raising the monthly old-age pension of war veterans from P5,000 to P20,000.